Power Distance: the extent to which the less powerful members of institutions and organizations within a country expect and accept that power is distributed unequally. Individualism: the degree of interdependence a society maintains among its members. In Individualist societies people are supposed to look after themselves and their direct family only. In Collectivist societies people belong to ‘in groups’ that take care of them in exchange for loyalty. Masculinity: A high score (Masculine) on this dimension indicates that the society will be driven by competition, achievement and success. A low score (Feminine) on the dimension means that the dominant values in society are caring for others and quality of life. 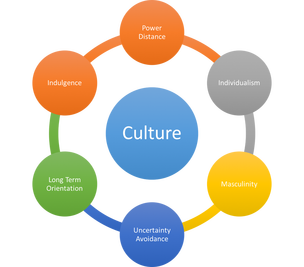 Uncertainty Avoidance: The extent to which the members of a culture feel threatened by ambiguous or unknown situations and have created beliefs and institutions that try to avoid these. The Power Distance in Vietnam is high, which means that people accept a hierarchical order in which everybody has a place and which needs no further justification. Hierarchy in an organization is seen as reflecting inherent inequalities, centralization is popular, subordinates expect to be told what to do and the ideal boss is a benevolent autocrat. Challenges to the leadership are not well-received. 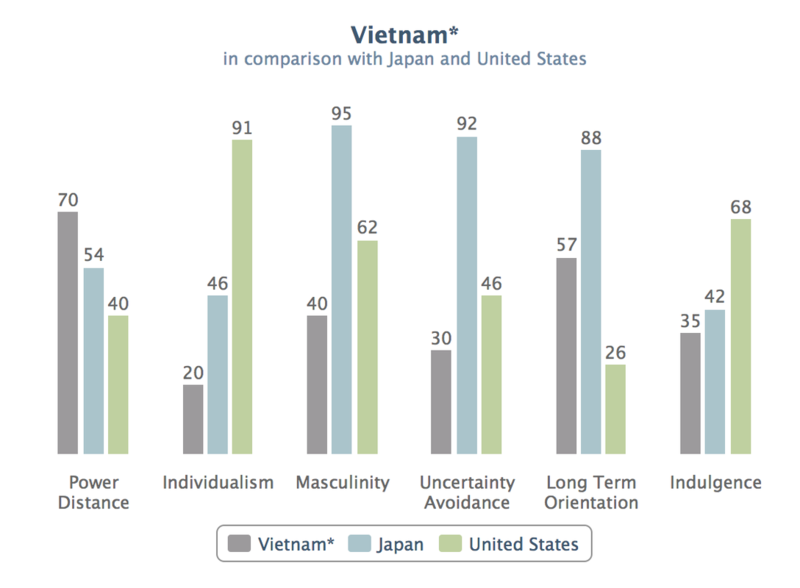 With a low score on Individualism, Vietnam is a collectivistic society. This is manifest in a close long-term commitment to the “member” group, be that a family, extended family or extended relationships. Loyalty in a collectivist culture is paramount and overrides most other societal rules and regulations. Such a society fosters strong relationships, where everyone takes responsibility for fellow members of their group. In collectivistic societies, offense leads to shame and loss of face. Employer/employee relationships are perceived in moral terms (like a family link), hiring and promotion take account of the employee’s in-group. Management is the management of groups. The score of Vietnam is low on Masculinity dimension and hence, it is considered as a Feminine society. In Feminine countries the focus is on “working in order to live”, managers strive for consensus, people value equality, solidarity and quality in their working lives. Conflicts are resolved by compromise and negotiation. Incentives such as free time and flexibility are favored. Focus is on well-being; status is not shown. An effective manager is a supportive one, and decision making is achieved through involvement. Vietnam has a low preference for avoiding uncertainty. Such societies maintain a more relaxed attitude in which practice counts more than principles and deviance from the norm is more easily tolerated. In such societies, people believe there should be no more rules than are necessary and if they are ambiguous or do not work they should be abandoned or changed. Schedules are flexible, hard work is undertaken when necessary but not for its own sake, precision and punctuality do not come naturally, innovation is not seen as threatening. On the dimension of Long Term Orientation, Vietnam is considered to have a pragmatic culture. In societies with a pragmatic orientation, people believe that truth depends very much on situation, context and time. They show an ability to adapt traditions easily to changed conditions, a strong propensity to save and invest. thriftiness and perseverance in achieving results. A low score of 35 on the Indulgence dimension indicates that the culture of Vietnam is characterized as Restrained. Societies with a low score in this dimension have a tendency to cynicism and pessimism. Also, in contrast to Indulgent societies, Restrained societies do not put much emphasis on leisure time and control the gratification of their desires. People with this orientation have the perception that their actions are Restrained by social norms and feel that indulging themselves is somewhat wrong. A more detailed information about the six cultural dimensions of Vietnam can be found here. The website also allows you to compare different cultures basing on Hofstede's cultural dimensions theory.